Propiconazole is a member of the DMI-fungicides group (demethylation inhibitors) These materials act on the fungal pathogen inside the plant at the stage of first haustoria formation and stop disease development by interfering with sterol biosynthesis in fungal cell membranes. Chlorothalonil has broad spectrum activity. It is believed that it deactivates several fungal enzymes (multiple-site action), therefore creating less resistance risk. Fludioxonil is a long lasting contact fungicide that provides broad-spectrum activity. It is believed to inhibit transport-associated phosphorylation of glucose, which subsequently results in the inhibition of fungal mycelial growth. A broad spectrum foliar fungicide with contact and systemic properties for control of Fusarium Patch, Dollar Spot, Brown Patch and reduction of Anthracnose on bowling greens, golf greens, golf tees and patch treatment on golf fairways. Harmful. Dangerous for the environment. This chemical is known to leach through soil into ground-water under certain conditions as a result of label use. This chemical can contaminate surface water through spray drift. Use of this chemical in areas where soils are permeable, particularly where the water table is shallow, may result in groundwater contamination. Do not eat drink or smoke whilst handling this product. DO NOT apply this product by spraying equipment carried on the back of the user. DO NOT carry out high exposure activities such as hand weeding in treated areas. DO NOT apply this product in a way that will contact workers or other persons, or pets either directly or through drift. Do not use on home lawns and turf sites associated with apartment buildings, daycare centers, playgrounds, play-fields, recreational park athletic fields, athletic fields located on or next to schools, campgrounds, churches and theme parks. Not to be used for any purpose, or in any manner, contrary to this label unless authorized under appropriate legislation. After each day’s use wash gloves, face shield or goggles and contaminated clothing. Wash yourself. Prevent spray drift onto surrounding areas. Do not apply to turf under heat or moisture stress. When tank mixing other products with INSTRATA, follow the proper sequence of adding products to the spray tank. Wettable powders or water dispersible granules should be added to the water in the tank first, followed by flowable products such as INSTRATA, and emulsifiable concentrates added last. Provide sufficient mechanical or bypass agitation during mixing and application. If INSTRATA is to be tank mixed with other products, add the products in the following sequence (as applicable): adjuvant / acidifier, wettable powder, suspension concen-trate, emulsifiable concentrate. Prepared spray mixture must not be left in the spray tank for any length of time, e.g. over-night. Make sure the sprayer is set to give an even application at the correct volume and an even deposit. With concentrate sprays, pre-mix the required amount of INSTRATA in a clean container and add to the spray tank as it is being filled. Fill the spray tank with water to the required level while maintaining agitation to ensure thorough mixing of the spray mixture before spraying commences. Maintain agitation while spraying. Shake the INSTRATA container thoroughly immediately before use. Add the required amount of product directly to the spray tank and mix well. INSTRATA is a suspo-emulsion (SE) with minimal odour. INSTRATA mixes completely with water and may be tank mixed with many commonly used fungicides and liquid fertili-sers. It has Weather Stik Technology that ensures excellent residual on leaf, stem and crown surface and a high degree of rainfastness. 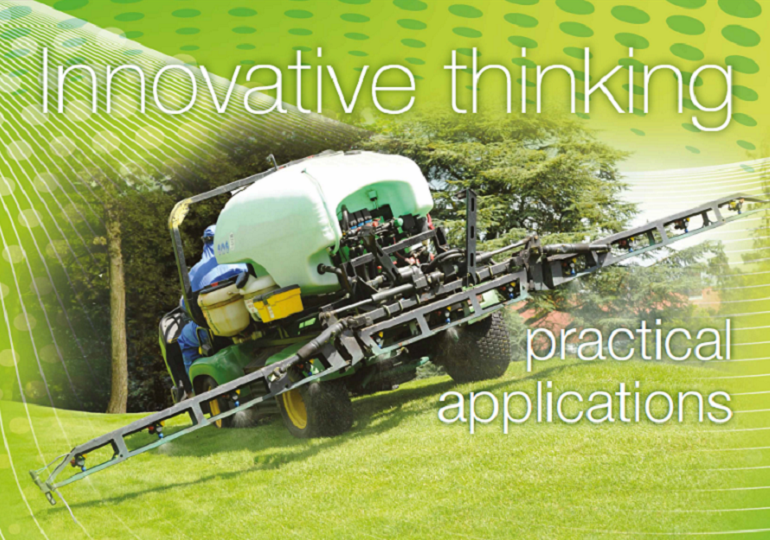 Do not combine INSTRATA in the spray tank with pesticides, surfactants or fertilizers, unless prior use has shown the combination physically compatible, effective and non-injurious under your conditions of use. Do not combine INSTRATA with horticultural oil, and products containing xylene as phytotoxicity may result from the combination when applied to some species on this label. DO NOT ALLOW DIRECT SPRAY from horizontal boom sprayers to fall within 10 m of the top of the bank of a water body, or within 1m of the top of a ditch which is dry at the time of application. Aim spray away from water. In the event of a Toxic or Transport Emergency in South Africa please telephone +27 (0) 8312 33 911 at any time.